You may remember this game as “Rise of Civilizations” and for good reason: This was the name of the game until March 5, 2019. On that date, Lilith Games decided to change the name to “Rise of Kingdoms ”. This was not the only change they made: The game has a couple more commanders, quality of life improvements, and new features. 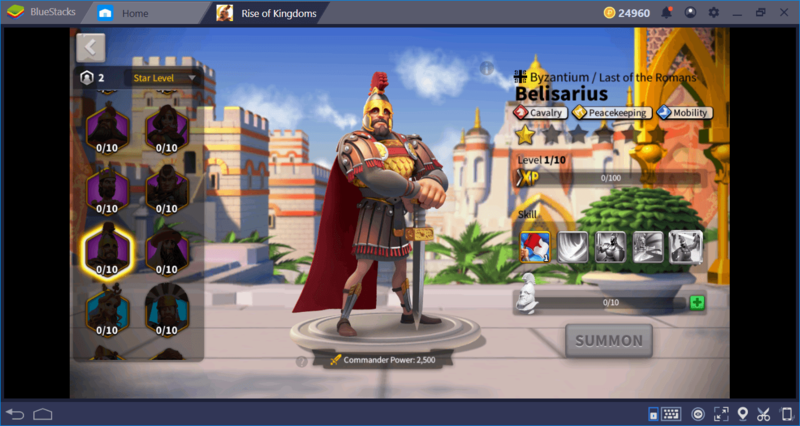 So, what do these new features bring and what’s the status of Rise of Kingdoms in 2019? Let’s answer these questions and start with the obvious one: Why did they change the name? 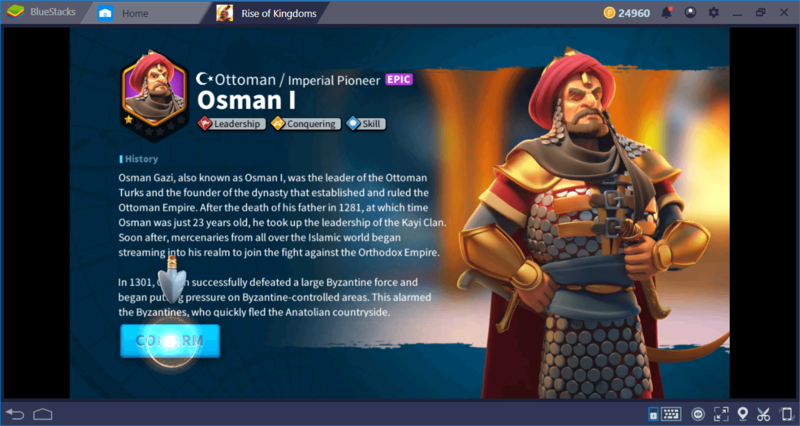 As a side note, because of the name change, you will notice that a lot of old BlueStacks Guides about Rise of Kingdoms (or should we say Civilizations?) have images that show the old name. We want you to know that the content in those articles still holds good for the most part except for few changes, which we talk about in detail below. Just try and ignore the old name that appears in some of the images there. After all, what’s in a name? Why Did They Change The Name To Rise of Kingdoms? Lilith Games explained the reason behind the name change with an official video. Simply put, they had some trouble registering the “Rise of Civilizations” brand in some countries due to legal reasons. It seems this is a popular title for a lot of RTS games, and in many countries, other developers already trademarked it as a brand. Instead of using a different name in those countries, they simply decided to change it altogether. 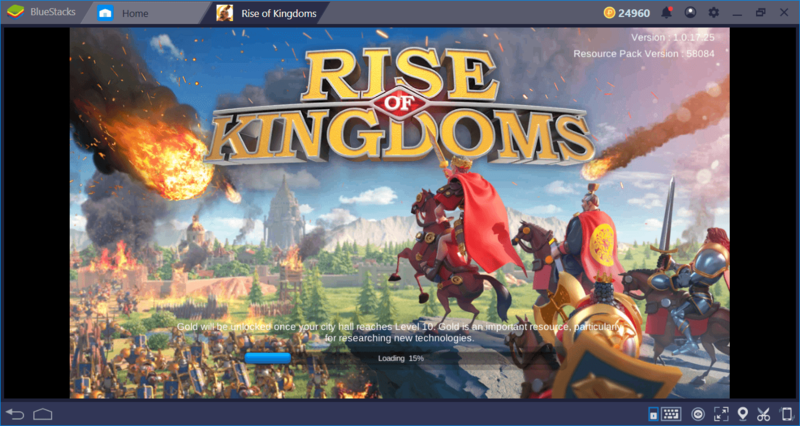 “Rise of Civilizations” is no more: This game is called Rise of Kingdoms from now on. 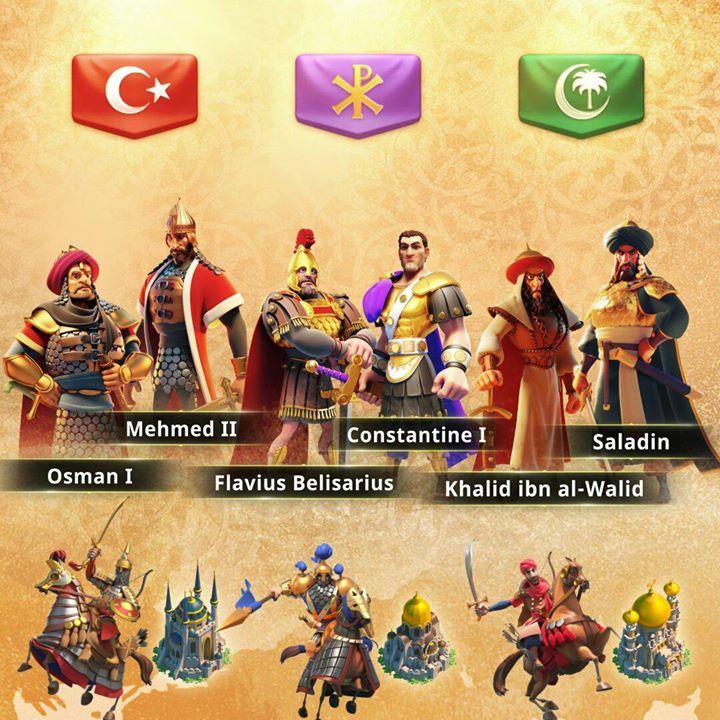 The new civilizations and commanders are focused on “attack”, as can be seen from their specialties. As you may remember, Germany was the best civilization when it comes to military strength, but it has two strong rivals now. Ottoman Empire gets a lot of bonuses for attacking other cities and empowering their armies, so if your goal is to conquer other civilizations before anything else, they seem to be the best option. Arabia is the second best in this regard, and Byzantium offers more balanced gameplay, focused on defense. In any case, we don’t think that these new commanders will change the ideal commander pairs, which we listed in another guide. However, you can always use Mehmed II or Osman I instead of Hannibal Barca to pair with Cao Cao. Or, pairing Belisarius with Osman I will give you a strong team for both PvE and PvP. All commanders have updated (and more detailed) talent trees now. 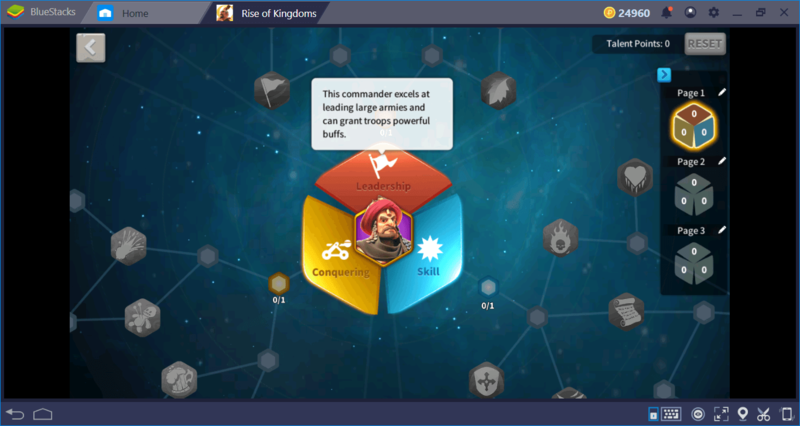 You can upgrade the specialties of commanders by assigning talent points and empower them even more. Talent trees are very detailed and you can focus on a single specialty to get better at attacking cities or defending them, for example. You can save up to three different talent setups for every commander. You may already have noticed this: The music in the game has changed. 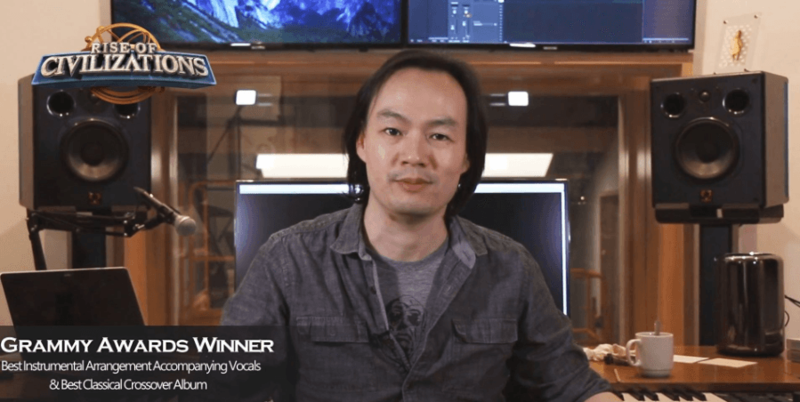 Christopher Tin, Grammy award-winning composer, composed new music and themes for every civilization in the game, plus, a new battle song. If your city hall is equal to or lower than level 7, you won’t be able to attack other cities now. 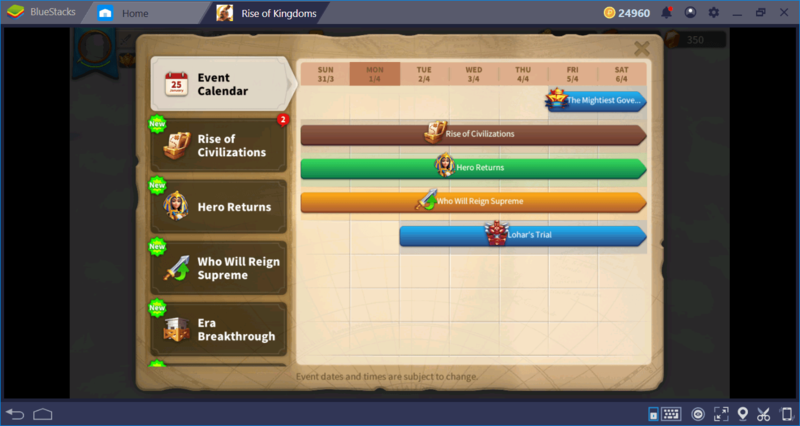 There is an in-game event calendar which tells you about the current and upcoming events. You can simply keep track of all weekly events from this calendar and join them easily. And finally, another big feature called “Kingdom vs Kingdom” is about to launch. We don’t have much information about this new update, all we have is a very short video that says “the lost kingdom awaits”. We know that it will be available sometime in April 2019 and most of the players think that it will be a huge battleground. According to speculations, we will be able to see 100v100 battles in here – this means 200 kingdoms will get to battle at the same time. However, nobody knows anything for sure: Once the new update goes live, we will prepare another article about it. Rise of Kingdoms currently sits at the top of free RTS games list and it is clear that Lilith Games will be offering us lots of new features in the near future. Well, we will be watching closely and preparing new guides to help you. For now, let’s keep playing with the new civilizations and commanders: The future seems bright. Speaking of which, don’t forget to take a look at our Rise of Kingdoms guides – they include everything you need to know about this game. See you on the battlefield!